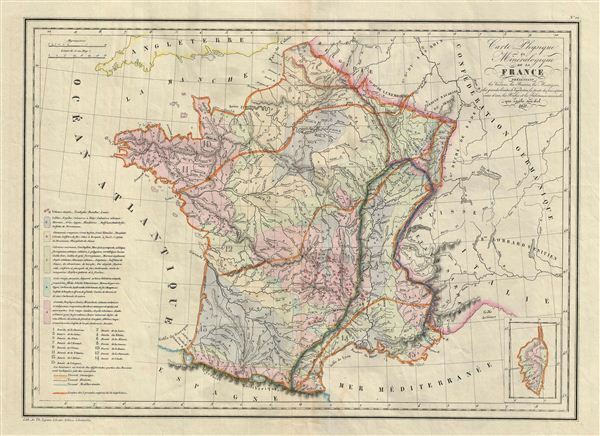 Carte Physique et Mineralogique de la France presentant les Versans, les Bassins, les Montagnes, les Grandes Limites des Vegetation, la Pente des Principaux Cours d'Eau, les Roches, et les Substances Minerales, que recele son Sol. This is a fine example of Conrad Malte-Brun's 1833 physical and mineralogical map of France. The map covers all of France with its basins, mountains, limits of vegetation, slope of major rivers, rocks, and minerals. The map is color coded according to geological units identified in a legend situated in the lower left quadrant. The lower right quadrant features an inset of Corsica. Various rivers, gulfs, mountain passes, lakes and other topographical features are marked with relief shown by hachures. This map was issued as plate no. 21 in Conrad Malte-Brun's 1837 Atlas Complet du Precis de la Geographie Universelle. Rumsey 0458.025 (1832 edition). Phillips (Atlases) 6079.